DeBONO. On April 16, at Mater Dei Hospital, MARIA STELLA nèe Camilleri, widow of Frank, passed away peacefully comforted by the rites of Holy Church. She leaves to mourn her loss her beloved daughters Marguerite and her husband Paul Bonello, Pauline and her husband Robert Tufigno, and Lucienne Attard, her adored grand-children Veronica and her husband Gilbert Micallef, Jean Marc and his girlfriend Yanika, Michele, Luca, Cristina and her husband Kyle Calleja, Nicholas, Nikolai and her great-grandson Timothy, her sister Cettina Pace, her in-laws, other relatives and friends who all cherish the memory of her love and strength. The funeral cortège leaves Mater Dei Hospital on Monday, April 22, for Christ the King parish church, Paola, where Mass praesente cadavere will be celebrated at 10am followed by interment at Santa Maria Addolorata Cemetery. No flowers by request, but donations to id-Dar tal-Providenza, Siġġiewi, would be greatly appreciated. Lord, grant her eternal rest. ELLUL. On April 16, VICTOR, passed away peacefully, aged 89, comforted by the rites of Holy Church. He leaves to mourn his beloved children, Roberta, Marianne and Pierre and his wife Anika, his grandchildren Sean, Christopher, Martina, Michelle, Tom and Lily, his brother Albert and his wife Doris, his nephews and nieces, other relatives and friends. The funeral cortège leaves Casa San Paolo on Monday, April 22, at 1.30pm for San Ġwann Parish Church where Mass will be celebrated at 2pm followed by interment at Santa Maria Addolorata Cemetery. No flowers by request but donations to Din L-Art Ħelwa would be greatly appreciated. The family would like to thank all the staff at Casa San Paolo for their care and dedication. Lord, grant him eternal rest. GAMBIN. On April 15, MONICA, aged 71, of Sliema, went to meet the risen Lord. She leaves to mourn her loss her brother John, widower of Joan, her sisters, Josette and her husband Anthony, Isabel and her husband Patrick, Bernadette and her husband Michael, her nephews and nieces, her great-nephews and great-nieces, other relatives and friends. 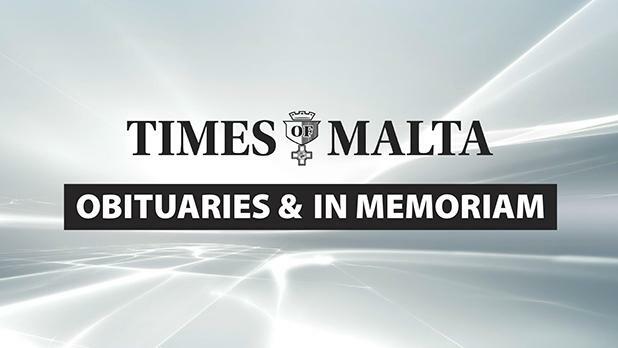 The funeral cortege leaves Mater Dei Hospital today, at 1.30pm for the parish church of Sacro Cuor, Sliema, where Mass will be celebrated at 2pm, followed by interment in the family chapel at Santa Marija Addolorata Cemetery. No flowers by request but donations to Id-Dar tal-Providenza, Siġġiewi, will be greatly appreciated. Lord, grant her eternal rest. The family would like to thank Mater Dei Hospital staff, especially the Intensive Therapy Unit department. MORRIS – ANTHONY. Born in Manchester, UK, on February 21, 1938. Sadly passed away on April 14 at Mater Dei Hospital. He leaves to mourn his great loss his wife Joan née Borg and family, his brothers and sisters, Andrew and Eilene Morris, Irene and Richard Brader, Wendy Kelly, Margaut and Don Morris. The funeral Mass will be held today, Wednesday, April 17, at St George parish church, Qormi, at 2pm. The family would like to thank all the staff at Mater Dei Hospital for their care and dedication. Lord, grant him eternal rest. ABELA – JOSEPH J. On the fourth anniversary of his passing to eternal life. Fondly remembered by his wife Marlene and his children Alan, David and Annelise and their respective families. Eternal rest give unto him, O Lord. BORG CARDONA. Everlasting memories of ANTHONY, today being the 19th anniversary of his demise. Fondly remembered by Gina, Ġuża, John and family. Forever in our thoughts and prayers. A prayer is solicited. May the Lord grant him eternal rest. PREZIOSI – COUNT Dr DRANZ. Loving memory on his 19th anniversary of his passing away. Always in our thoughts and prayers. His wife Suni, son Josef, daughter-in-law Caren and grandchildren Marie-Christine and Fabrizia. RADMILLI – NOEL. Fondest memories of a loving husband and father today the anniversary of his passing away. Sandra, Rachel, Paul and Gabriella. RADMILLI. In loving memory of our dear brother NOEL on the 11th anniversary of his demise. Always in our thoughts and prayers. David, Victor and Suzanne.